The tenants, staff, and supporters from the Unite Housing Workers Branch were protesting at a Peabody roadshow (complete with 'Digi-Van'), at which the large parent sought to persuade tenants to accept their 'offer' of different arrangements for the ownership and governance of the smaller subsidiary, CBHA. Many tenants and residents visited the roadshow, but instead of speaking to the Peabody managers, including the Director of Housing who was in attendance, they swarmed around the 'No Peabody Takeover', signing the petition, taking bundles off leaflets to distribute amongst neighbours, and pledging to get actively involved in opposing the dismantling of their much-loved CBHA. Tenants reported that the Peabody representatives had told them that the only discernable difference under their proposals was that the logo would change. What they weren't told about was that satisfaction rates among CBHA tenants without exception exceeded those of Peabody, in some cases by a large margin. CBHA satisfaction rates for handling ASB is 100%, compared to just 59% at Peabody. This results not from any lack of commitment by hardworking Peabody staff, but by the priorities of the Peabody management whose commitment is to the commercial 'bottom line', rather than to residents. 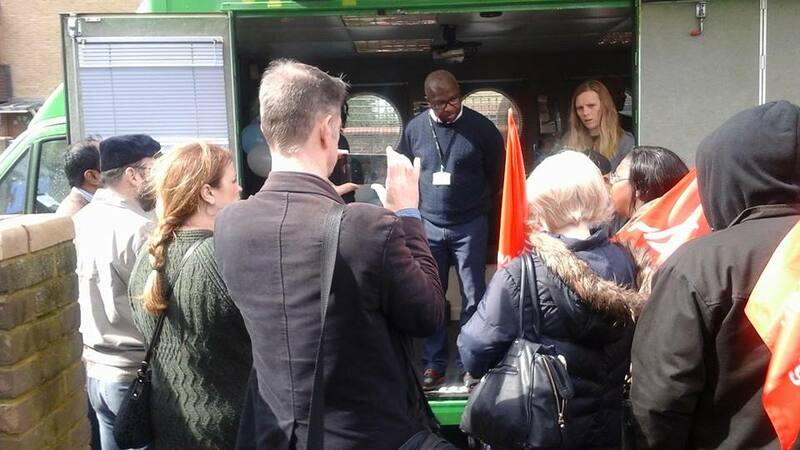 Shortly after the roadshow began, a large group of tenants, staff, and other community supporters gathered round the Peabody Digi-Van and asked the senior managers to explain why they were being less than transparent about what the changes would mean. They made it clear that the tenants did not want to be subsumed into the Peabody supergiant and urged the managers to listen to them. They pointed out that similar offers had been made by Peabody on three previous occasions, and all were rejected. This time, however, Peabody appear more determined. Senior Peabody managers kept insisting that no decision had been made. However, when protestors suggested that they ballot the residents, and asked them to commit to honouring the outcome of such a ballot, Peabody wholly ruled this out, saying the law only required them to consult, and this is all they would do. Peabody would then make a decision, taking resident views 'into consideration', but without any obligation to honour their wishes. During the discussion, residents spoke passionately about their reasons for rejecting the Peabody offer. They described the conditions that had existed on the estates before CBHA came into existence, where residents were afraid to let their children out to play, where the physical conditions of homes were often unfit, and where repairs and maintenance were tardy and poorly carried out. CBHA was developed as a resident-led association, with a majority of tenants on the board and with a tenant-Chair. It had succeeded in replacing these estates with neighbourhoods that people want to live in, where residents have a strong input into the running of the organisation, and problems can be quickly addressed. It has not been easy to make the changes, but the success is a result of hard labour by active tenants and highly committed staff. It was obvious to all that they would not just let this fall away into the hands of an organisation that doesn't staff its services adequately, doesn't offer decent pay and conditions to its workers, and which prioritises income generation over addressing tenant concerns. If anything, Peabody should be learning from CBHA and adopting their model of resident-led governance, rather than engaging in a race to the bottom.